Nautical Cape Cod Meets California Coastal Style! This storybook Bokal and Sneed home was designed to complement its idyllic location within walking distance to the Del Mar Village and steps to the beach. This charming home was custom built in 2010, with the highest level of quality craftsmanship and finishes, to take full advantage of San Diego's coastal climate with a fusion of indoor/outdoor living areas. This extraordinary beach home has been impeccably and meticulously maintained by original owner., Floor to ceiling glass doors open seamlessly with a lift and slide design, exposing a 370-square-foot covered patio. Brick floors flow from the sunroom to the patio to further support the fluidity of the living space. The heart of the house is a gorgeous galley kitchen with white quartz countertops, a six burner Wolf range, and a Sub-Zero refrigerator. The exterior of the home exudes a traditional Cape Cod feeling with double-hand-dipped cedar shake shingles, while the interior features custom-milled board and batten walls, open-beamed ceilings, and crown molding, for a bright beachy aesthetic. The master bedroom features a cozy wood-burning fireplace with a marble surround and 12' ceilings allowing natural light to flood the room. The master bath was designed with comfort and relaxation in mind with an over-sized steam shower and "Tea for Two" Kohler bathtub, and the gorgeous marble countertop gives the room a luxury feel. 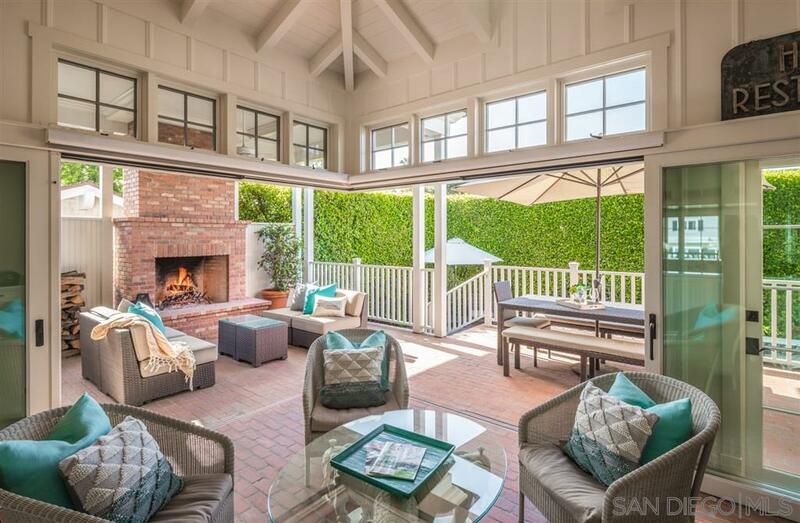 The indoor/outdoor living is unparalleled along the coast and was featured in Better Homes & Gardens Magazine! Entertain on the covered patio featuring a cozy, yet sophisticated, outdoor brick fireplace designed by architect Jim Sneed, or enjoy the additional 450-square-foot ipe wood deck. Both the patio and deck are surrounded for privacy by lush mature landscaping , and a custom outdoor shower is the perfect place to rinse salty bodies and sandy surfboards. Don't miss the opportunity to own this truly one-of-a-kind meticulously designed home in one of the best locations in Del Mar!